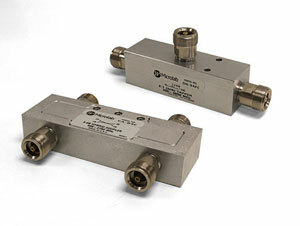 Microlab, a Wireless Telecom Group company (NYSE:WTT), is excited to announce the addition of 4.1-9.5 DIN connectors to its low passive intermodulation (PIM) product line. This builds on their commitment of providing wireless operators and their system designers with the most flexible and reliable components for distributed antenna systems, macro, and small cell applications. Informally known as Mini-DIN, 4.1-9.5 DIN connectors provide the robust electrical and mechanical performance of a 7-16 DIN in a size comparable to an N-Type connector. "Our customers require a variety of connector options as they deploy indoor and outdoor coverage solutions,” says Gregg Albrecht, Applications Engineer at Microlab. “4.1-9.5 DIN connectors offer low PIM and excellent return loss in a small profile. 4.1-9.5 DIN connectors are ideally suited for high speed wireless communication systems such as LTE. Using low PIM components has been proven to increase coverage and capacity." Mini-DIN connectors are available on selected product families, integrated signal conditioner DAS trays, combiner trays, and low PIM jumper cables. These product families are now available with 4.1-9.5 DIN connectors will continue to deliver on their proven reliability, power handling, broad frequency range support, and low PIM performance while adapting to the needs of future and current systems. Visit our website to view other connector options and our complete product line of low PIM assemblies, components, and cables. Microlab products with Mini-DIN connectors are available for immediate sale from our factory in Parsippany, New Jersey. Please contact our sales department for more information.